What are these vents in the foundation mortar for? Throughout the interior side of my 1925 brick foundation are little metal vents embedded in the mortar at irregular intervals. Neither our home inspector nor our real estate agent knew exactly what they were for. The vents are about the size of a quarter. They seem to simply allow moisture in through the wall, despite the waterproof paint on the bricks. I can't imagine this is the intended purpose. Has anyone seen these before? Any idea what these are for? Update, 30 August 2013: I finally got around to pulling some of these vents out. Behind them is... nothing. Just mortar. No tubing of any kind, just an approximately ping pong ball-sized divot in the mortar. They appear to be weep hole covers. 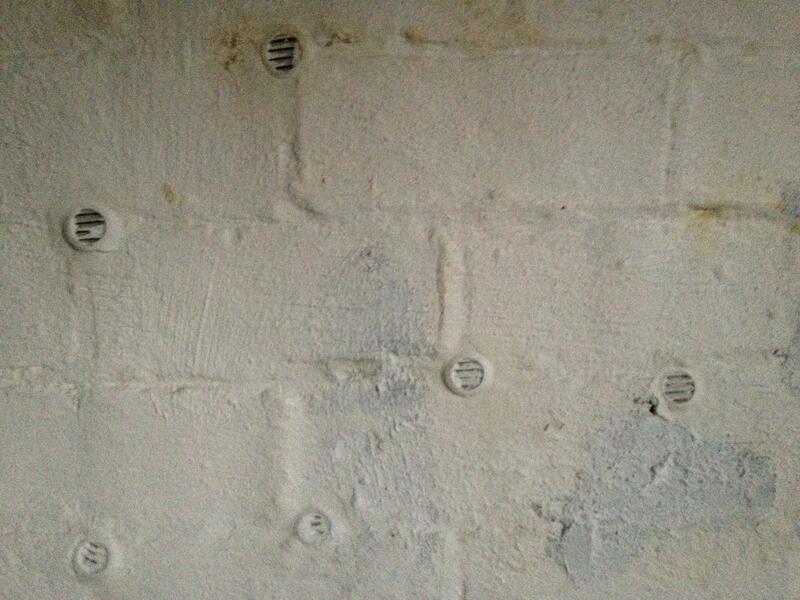 Weep holes today usually consist of a vertical slot; the result of not putting mortar in a joint. This might have been a retro-fit to address a moisture problem since they are not evenly spaced and are round, which would make sense if holes were drilled in the brick for drainage. Weep holes are vital to prevent rot of the structural wood framing that's probably on the other side and to minimize moisture inside the brick wall that can freeze and crack the brick in cold climates. Couldn't find a definitive article with picture but here's more on drainage of brick walls. Proper ventilation in enclosed spaces can reduce the chance for mold and mildew. If they are allowing moisture in, the proper thing to do would be to remove them and to fill the voids with concrete before sealing them over. I would also make sure there is adequate ventilation in the basement after you do this by installing a proper vent or other means. You could ask for an estimate from a contractor and use that as a bargaining chip when negotiating for your home. Not the answer you're looking for? Browse other questions tagged brick waterproofing foundation moisture or ask your own question. How do I remove crumbling mortar from fieldstone foundation? What technique(s) is recommended for waterproofing exterior foundation walls? What are some good concrete and foundation books? Is this normal for the brick to extend past the concrete slab foundation? Are these foundation issues significant? Water seeping through my foundation in the garage - what is the source? What can I do about cracks in a stone foundation?